The Gonds are the tribal community mostly found in the Gond forests of the central India. They are widely spread in the Chhindwara District of Madhya Pradesh, Bastar district of Chhattisgarh and also in the parts of Maharashtra, Andhra Pradesh, and Orissa. 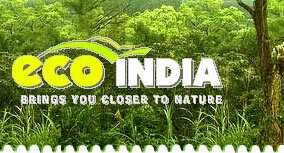 The name by which the Gonds call themselves is Koi or Koitur which means unclear. Gonds are one of the largest tribal group in the world. Gonds finds mention in almost the historical books of India. Gonds settled in the Gondawa in the ninth and thirteenth century AD. In the fourteen century they ruled several parts of the central India. They built number of forts, palaces, temples, tanks and lakes during the rule of the Gonds dynasty. The Gondwana kingdom survived till late 16th century. Gond dynasties ruled in four kingdoms - Garha-Mandla, Deogarh, Chanda, and Kherla in the central India. Gonds have been the warriors since the British period. During the British regime in India, Gonds challenged the Britishers in several battles. They also gained control over the Malwa after the decline of the Mughals followed by the Marathas in the year 1690. 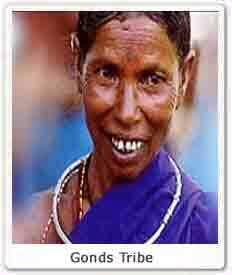 Gonds tribe speak Gondi language which is related to the Telgu and the other Dravidian languages. In the northern parts Gonds are often seen speaking the local Hindi and Marathi. Some of the Gonds in the southern parts also speak Parsi or Persian. Gonds are mainly divided into four tribes namely - Raj Gonds, Madia Gonds, Dhurve Gonds, Khatulwar Gonds. Gonds men wear Dhoti, which is the lonf piece of cotton cloth wrapped around the waist passing through the legs. Women wear soft cotton saris along with the Choli or blouse. The staple food of Gonds are the two millets known as Kodo or Kutki. Rice is the ceremonial feast of the Gonds, which they prefer eating during the time of festivals. Most of the Gonds are the meat consumers. Gonds have been largely influenced by the Hindus and for the long time have been practicing the Hindus culture and traditions. Gonds are the worshipers of Janani or the mother of creator. They use the title Thakur. Gonds mainly worship Pharsa Pen, who is worshiped under the form of the nail and sometimes a piece of iron chain. Besides Pharsa Pen, they also believe in several other Gods namely Mariai  the Goddess of plague and other diseases, and Bhimsen  the Hindu God. Apart from these God and Goddess, their exist great number of deities and spirits in the beliefs of Gonds. According to them every hill, river, lake, tree is also inhabited by a spirit. They say that the the earth, water and air are ruled by the great number of deities which must be appeased by sacrifices. They have priests (devari) who perform all the religious formalities on all the occasions. Gonds also pay homage to the Gods of household, Gods of Cattle, Gods of fields. Animal sacrifice on the religious occasions is the common practice among the Gonds. Customs and Festivals : Gonds fair and festivals are influenced from the Hindu traditions. Keslapur Jathra is the important festival of the Gonds. In this festival they worship the snake deity called Nagoba, whose temple is found in the Keslapur village of Indervelly mandal of Adilabad district. Gusadi dance is the most famous dance perfomed by the Gonds. It is performed by wearing head gears decorated with the peacock feathers. They wear cotton cloth around their waist. They smear ash all over their body and beards made of animal hair is also important part of the dance costumes. Madai is the another major festival celebrated among the Gonds. It is the festival when Gonds meet their relatives settled in various parts of the country. During this festival they also sacrifice goat beeath the sacred village tree to appease the tribal Goddess. In the night they enjoy liquor and dance along with the tribal music. Apart from this they also celebrate Hindu festival called Dusshera.